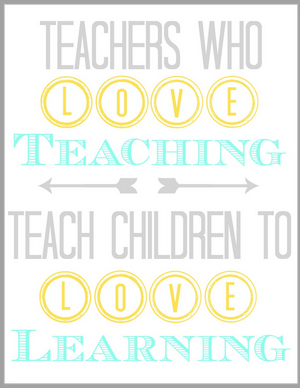 Day 4: "Respond: What do you love most about teaching?" I love the journey I take with my students every year, learning with them and from them. I love the relationships I form with students and their families. I tweeted yesterday that I call my students "my kids" because they really do feel like that. I proudly bring my family into my classroom to work with "my kids". Even when they move, on they still feel like a part of me. Running into former students, having class reunions and being the person they contact when they need something or want to share happy news is a true priviledge. I love being the person who believes in a room full of kids, some of whom don't yet believe in themselves. I love seeing them do things they never thought possible. I love that every day of my job is different. I love getting to be creative, innovative and experimental. Thinking of something or reading something one night and then trying it the next day is amazing. I love being the Lead Learner and a Collaborative Curator with my students. I love collaborating with colleagues in my building and around the world. I love how much inspiration I get each and every day from my students, my colleagues and my PLN. "Are you finished your tweet?" "Why are you Imagineering, then?" "I'm actually doing my Dream Class right now." I feel so lucky to have found a job that is so much more than just a job. Teaching is my hobby, my habit, my passion, my vocation and my calling. I can feel the love you have for your students just dripping off the page as I read it. I agree with you-"teaching is my hobby,my habit, my passion, my vocation and my calling". Yes! How anyone teaches who doesn't feel this way really is beyond me!